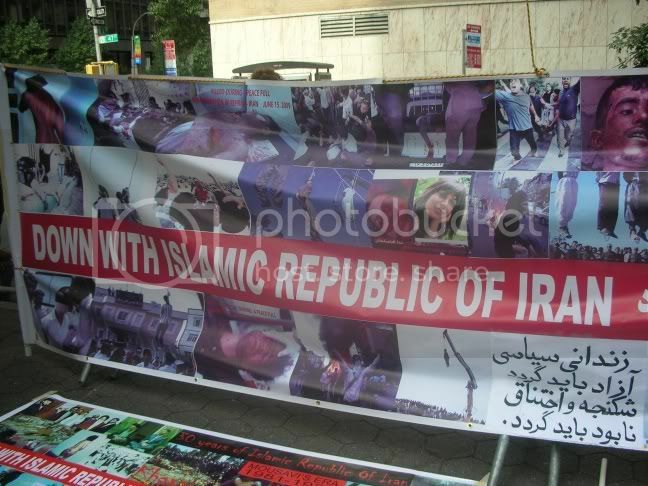 A spirited Rally, organized by Iranians appalled at the brutality and egregious violations occurring in Iran, took place in New York City on September 23 and 24. 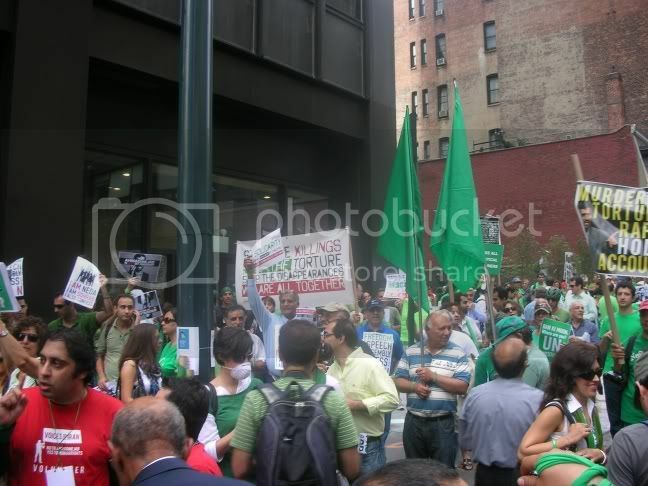 I have taken a great interest in the situation in Iran and I decided to go to New York City (on the twenty-third) to participate in the Rally and join in protesting the invitation and appearance of Mahmoud Ahmadinejad at the United Nations Summit. I wanted show support to the Iranians who are fighting for basic human rights in their country and to show people of Iranian descent living in North America that there are people who care about and are very interested in and very concerned about the brutality and the quest for freedom in Iran. The events that have taken place in Iran are, to me, very extraordinary, very exciting and very emotional because this is true change. A true revolution is taking place. These are a people who are fighting against an oppressive regime and all of us in the West have much to learn from them. People in America are quick to criticize ruling entities in other countries - sometimes rightfully so, but when Revolutionaries in these countries challenge the respective ruling entities and need our support or, at the very least, our acknowledgement, these same American critics are absolutely reticent, uninterested or ignorant to the Revolutionary events taking place. These brave, committed, steadfast Iranians have made the first move and for their efforts, their cause and their plight, I find it obligatory that I myself join in these Protests regardless of where I reside on planet Earth. I told myself, "I cannot go to Iran, but I can go to New York" and l did go to New York because this was too important to neglect. The Iranian Protesters are facing almost insurmountable odds, but their resolve is impregnable. This is their fight and this is their quest for freedom and they wish to succeed on their own by their own means through their own efforts but they want and need expressions of support from all over the world. I am someone who is heavily involved with preserving the memory of my nation's Revolution in the 1700s. 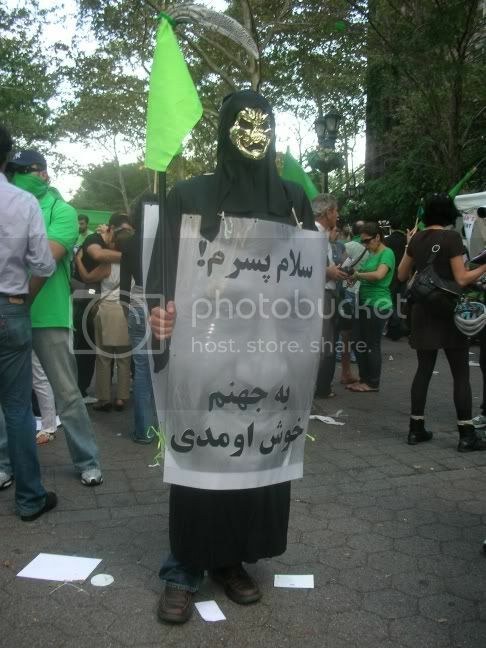 It is only fitting that I give proper exposure to the current Revolution in Iran and help in any way that I can. 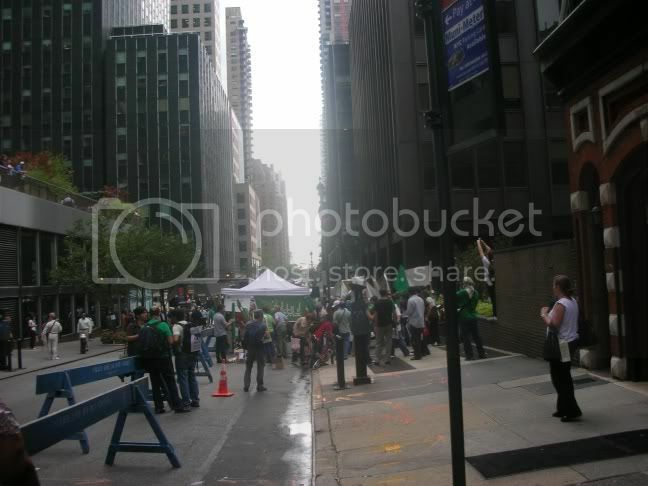 As for the Rally and Protest on September 23, I left my house at 9:00 AM, drove to the train station and arrived in New York at 11:45 AM. 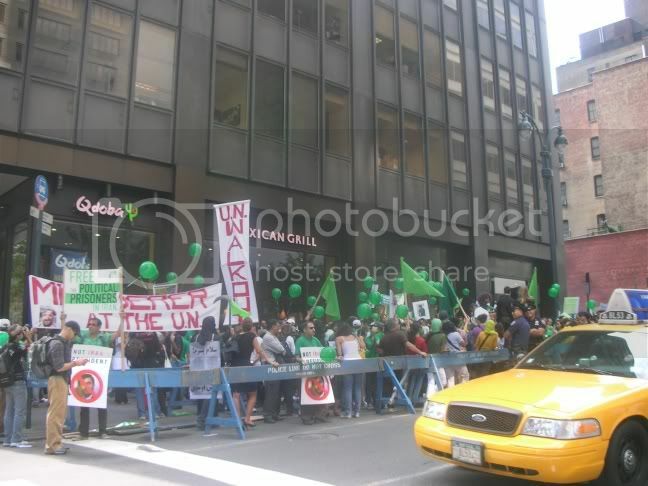 As I made my way through the streets of New York City, inching closer and closer to the U.N. building, I stumbled upon one lively Rally which featured various chants (such as "Hey hey, oh oh, Ahmadinejad has to go!" and others in the Parsi/Farsi language), musicians, lectures and words of encouragement. 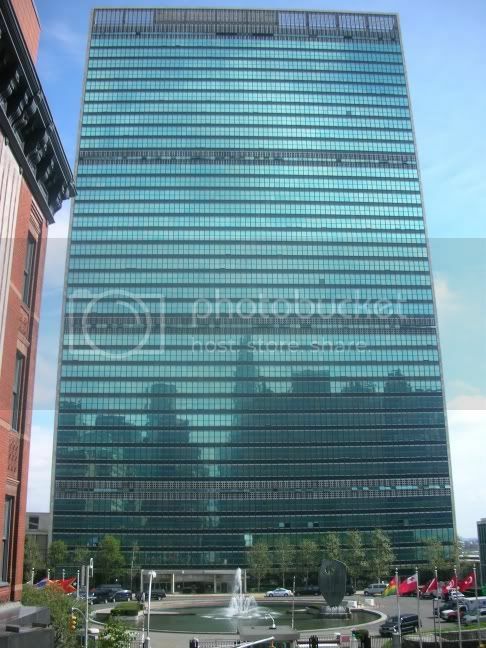 I later walked by the U.N. building and finally made my way to the area where the final part of the Rally was held. 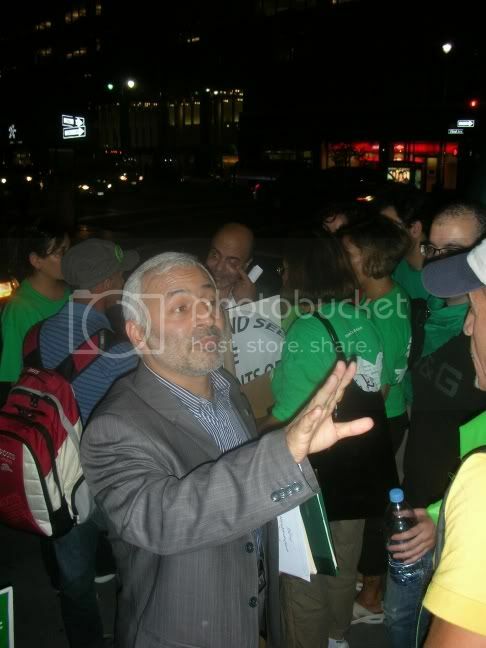 Eventually word spread as to where Ahmadinejad was staying so we planned to give him a bit of a greeting. As evening came and light turned to darkness, a few dozen die-hard Protesters remained. Two of Iran's delegates/representatives for the U.N. Summit actually came out to talk to us (not that I knew what was said - the conversations and arguments were in Parsi/Farsi). 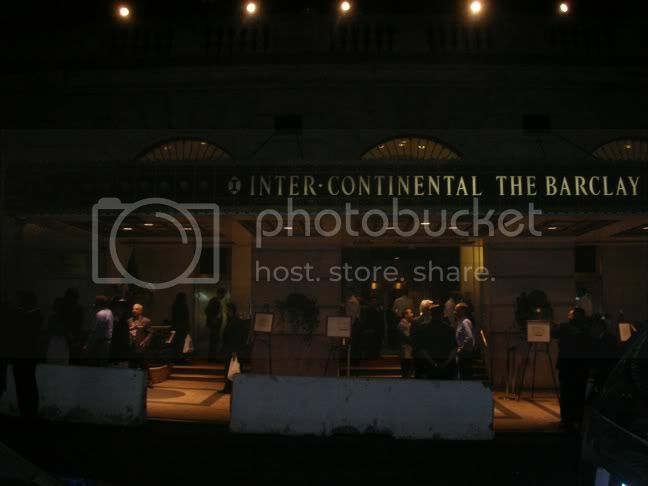 We finally made it to the hotel where Ahmadinejad was staying (the "Inter-Continental The Barclay" ... kind of a weird name but that was the one). We were told to congregate inside one gated area, moved to another gated area down the street and then finally thrown out at 10:00. I took the 11:05 train out of town and was finally inside my home at around 1:45 AM. Rain was projected for the entire day, but luckily the light drizzling ended prior to the beginning of the Rally and did not start again until a few minutes after the Rally ended. Talk about luck!! I suppose the clouds knew about our Rally and were on our side. I have to tell you - the entire day was AMAZING!!! Since I was about the only blue-eyed person there, a few people took notice and said thank you to me. One man asked me what drew me to the event and a woman looked at me and said "You aren't Iranian" and after I explained my position (pretty much the same as what I have typed in the second paragraph above), they were deeply touched and appreciative. I met some really cool and well-intentioned people. 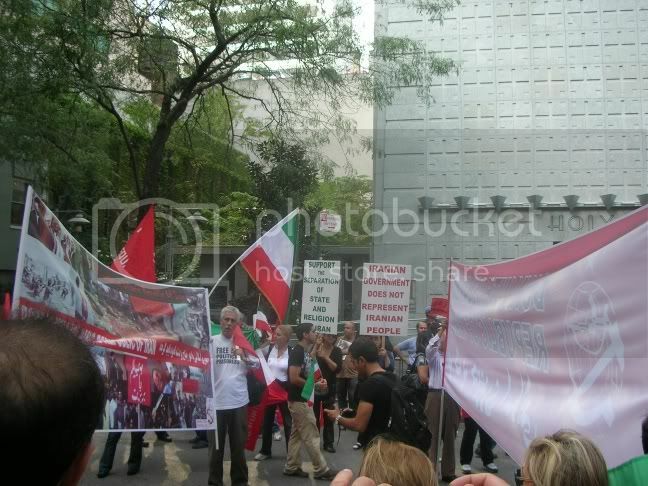 The Iranians in attendance were motivated and out in full force. The Rally was so incredible - I didn't want the day to end! I have never attended a Protest and Rally before. I figured I would someday, but I had previously never found a cause that really resonated with me enough to put thoughts and well-wishes to action. 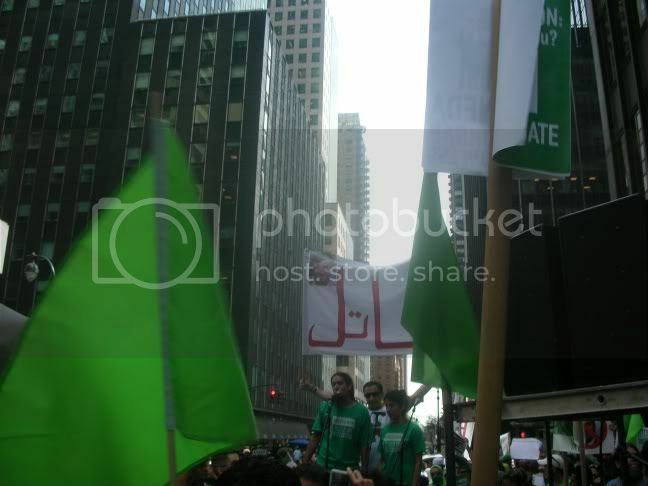 That all changed - regardless of how many I go to in the future, this Rally and show of support to the Iranian Protesters will always be my first. I also learned about a new song. I am open to hearing music from other cultures and am always looking for new material - it is even better when I stumble upon a new song. That is exactly what happened on this day. I heard a song played over the loudspeaker and later, it was sung by the crowd a cappella. The title is "Yare Dabestani Man" (I have seen different spellings on the web) and it has been used as the rallying song for the Protesters. If you look up videos, pertaining to the situation in Iran, on youtube, you will hear this song in many of them. Great beat ... you can even imagine a huge uprising or revolution occurring to the sound of the music. It was a great day for the cause and also to learn a bit more about Persian culture. By the way and this is EXTREMELY important ... throughout the day, people were holding up signs with the face of Neda Agha-Soltan (the innocent young woman who was killed in Iran back in June) on them (I had one myself). The vast majority of the signs did in fact have her face on them, but I did notice a couple of signs showing another Neda - a Neda who is still alive and very distressed that her photo is all over the place now!! Everyone has to get rid of the photos showing the living Neda right away!! 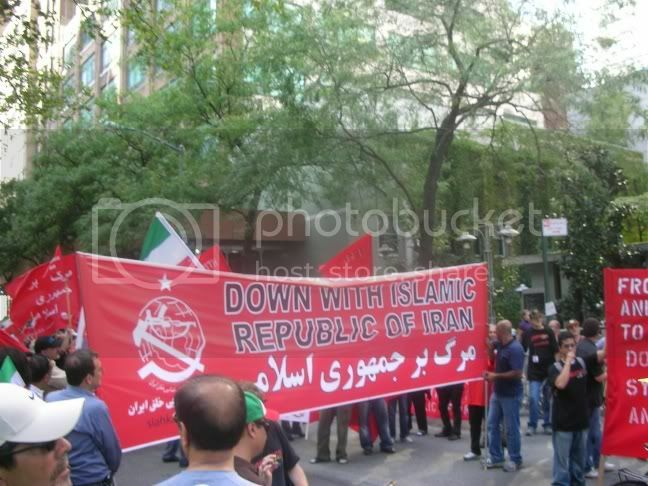 Showing support to the Iranians!!! Nevermind the penmanship, haha. 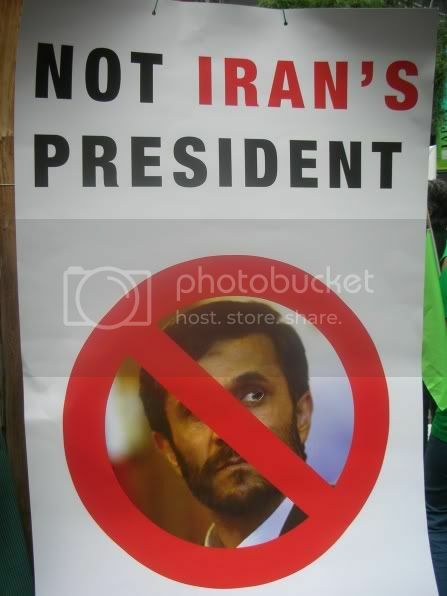 Mahmoud Ahmadinejad was in this hotel at the time this photo was taken!! Michael,you're the man. Great work . Hi there. Thank you for the comment. The least I can do is spread awareness of what these amazing Protesters are doing. They are no doubt the Revolutionaries of our time and I am doing my best to let them know that I stand with them and am really hoping for the best. We are all in this together as human beings.